IBR hopes that all of this comes true for the many dogs that are waiting in the wings for someone to share their love of the great outdoors with. Through our devotion to bring hope to the strays, abandoned and forgotten's, while also helping them heal from their past, that their future with you will be a blessing for both of you. Through your help and continued belief in our program, we will continue to make happy dogs and try our best to also give them healthy days ahead. Linda S Nelson-thanks IBR for all you do. Beginnings, where Mother Nature awakens the flowers into beautiful blossoms. We would like to think we do the same. By giving the scared and frightened, the sick and the old, a chance to bloom into a confident dog once again. Without your generous donations, we couldn't accomplish this. Thank you, from all of us. 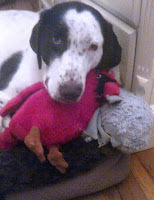 In loving memory to a very special Setter, Lucy Klein. Lucy was the rock and soul for 10 yrs. to her loving family. She also was the big sister to her adopted brother and former IBR rescue, Finn (in the background). They became fast soul mates and always by each other side. The loss of Lucy was devastating to her family and hard for Finn as well. She will be deeply missed by many who knew her and this donation speaks volumes of how she touched so many. Donations made by; Lisa Martin, Tisha Brady, Scott Dunn, Marci Clow, Tonja Schenk, Margaret Edwards and Michele McRae. Cleaning. A month when people start throwing away the old and used. Unfortunately, many people think dogs are in that category as well. With the dedication and devotion from people like you, we can save, nurture, and love these, so-called throw-aways, and give them back their self worth and reap their love in return. shamrock. The dogs we are able to rescue are truly the lucky ones, to have people who care about someone they never met or will most likely ever meet. IBR finds the 4 leaf clover's good fortune every day, week and month, when we are able to help yet another dog in need and so grateful to you for helping us accomplish this. Hopefully, the luck of the shamrock continues for them in finding their fur-ever homes. Thank you! February is known for the Love between one another. Illinois Birddog Rescue and the foster homes that care for the lucky ones that get a second chance have you, the donor, to be grateful towards. We can love them, care for them and prepare them for their furever homes, but NOT without you. From the bottom of our hearts, we are so thankful for your compassion and love for our dogs in need and believing in us enough to open your hearts to help us. This month is also the 5 year anniversary sadly, for the heart and soul of IBR, Westleigh. Without him and the passion he exhibited on a daily basis, other dog's futures may have been very different. 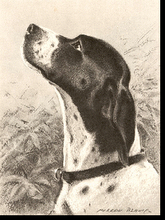 Wes was a strong and stunning English Pointer that had the determination it took to exceed in whatever was put in front of him. He fought a strong battle that just was against all odds, but as this Memorial in his honor continues, it exemplifies the strength and will that all our dogs come to us with, NEVER GIVE UP. As long as there are dogs out there that won't give up, either will we and hope that you too, continue to believe, WE CAN MAKE A DIFFERENCE. We can see their soul through the eyes of the lonely, confused, and scared creature behind the cold steel bars. We can hear the unspoken words that they convey through their eyes and have a piercing arrow straight into our hearts. Cupid is not just a February icon, but one that lives throughout the year. For those that are fortunate enough to reach people are truly the blessed ones that get adopted and loved for eternity. Sometimes our expectations of eternity is far less than what the meaning has in store for us, but they have come to us with a purpose from their Creator and when their assignment has been completed, it's time to move on to help others. Waiting at the Rainbow Bridge for us to once again be reunited, but in the waiting moments of time, we are reminded that their purpose of touching our lives was to show us that we can help so many more in need. That the memories will always be there. The Love will never fade. That the power of that love can touch so many, which is so unexpected. They're brought to us on Special Assignment. They have, as will others, continue to do their tasks beyond the conscious knowledge of the humans they touch. As shown through the donations made in their memory, one can sense the importance of their being and the love they brought to so many. They are just ones of thousands that touch people with loving tender hearts, but no more important as the ones we can't save. IBR and the many other rescues and shelters out there struggle ever day to make a difference. But it really does come down to You, the donor, who believe animals, whether it be dogs, cats, horses, etc., do deserve to be treated with respect, not abuse or neglect. With heartfelt gratitude, we honor You through our Blog, for helping and giving the ones without a voice a second chance. Orange & Blue Distributing Co.
January brings in a New Year and new resolutions/goals. IBR's resolution doesn't change from year to year. It's to help all dogs possible, educate the public on the importance of spay/neutering and the preventive ways to fight against heartworm and tick borne illnesses. We will continue our quest to find answers to how and why some dogs suffer more than others, when infected with these illnesses, and hope that our commitment will make a difference. Through your support and belief in our causes, we can move forward towards this year's goals. We would like to thank those that are committed as we, in helping our rescued friends, through your generous donation. The average cost of vetting for one of our rescues can range from $300 to $500-especially for our out-of-state dogs. The average cost of Heartworm treatment can run $200-$400 from start to finish. Special needs dogs can run into the thousands. Hep us help these wonderful and deserving dogs with a tax deductible contribution. To learn more about the sponsorship, please visit the IBR Home Page.